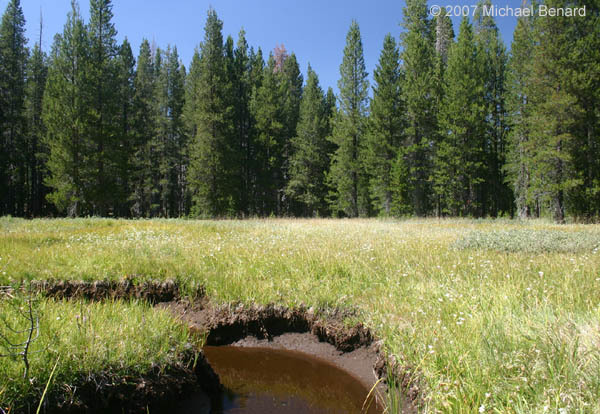 Every summer, intense life and death struggles play out between predators and their prey in the shallow pools of water dotting the meadows of Yosemite National Park. For the prey, capture means death. For the predator, failure to capture prey can lead to starvation. The struggles are intense, yet these battles are easily overlooked by park visitors. 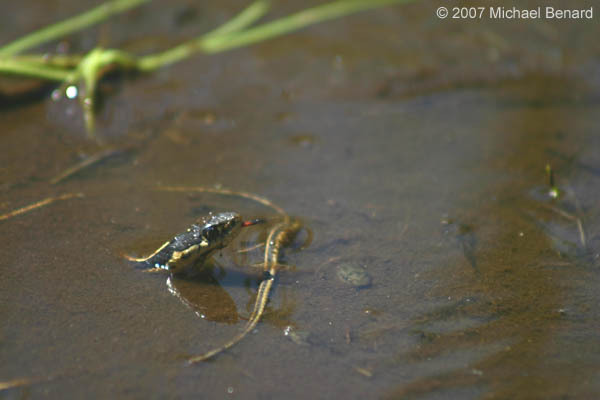 This is because the opposing players are tiny; the predator, the mountain garter snake (Thamnophis elegans) may be less than two feet long, while the prey, the pacific treefrog (Pseudacris regilla) is smaller still. 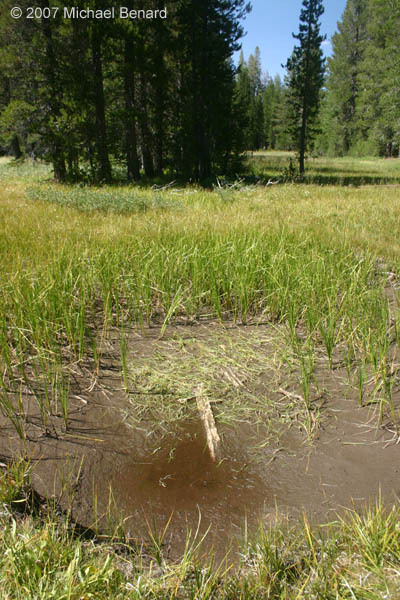 While walking through one of the meadows in early August 2007, my brother-in-law and I had the chance to observe one such struggle. 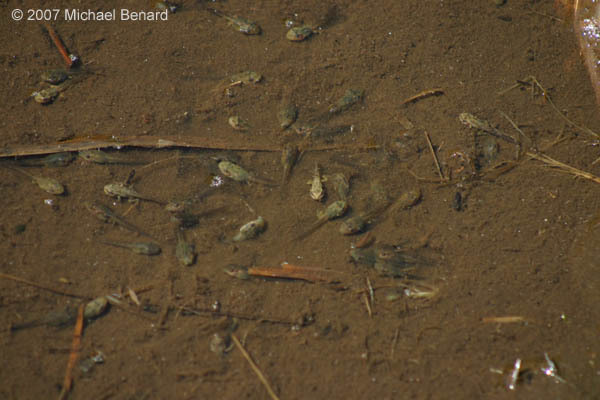 The summer had been dry, and the shallow water of the pools made it easy to observe dozens of pacific treefrog tadpoles. 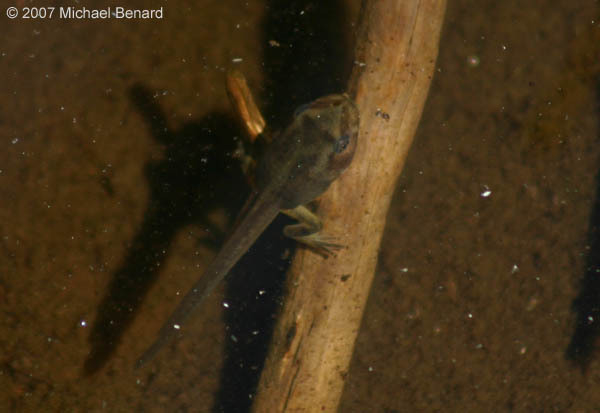 The tadpoles were in a range of different developmental stages, from a few with four fully developed limbs to others with just stubby hind legs. Some of the pools had completely dried, while others were still in the process of drying. 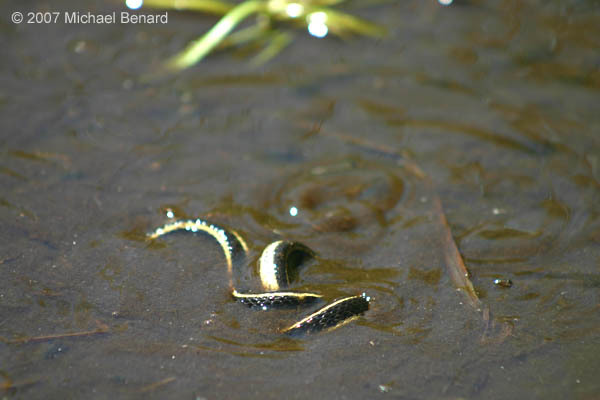 In the drying pools the pacific treefrog tadpoles were crammed together in the hot, shallow water. 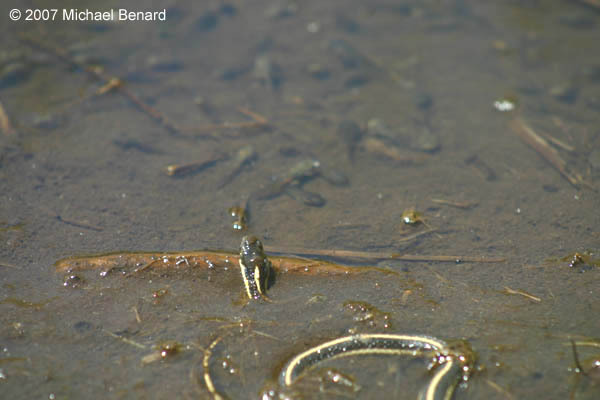 With little room to escape, the tadpoles presented a potentially easy meal. 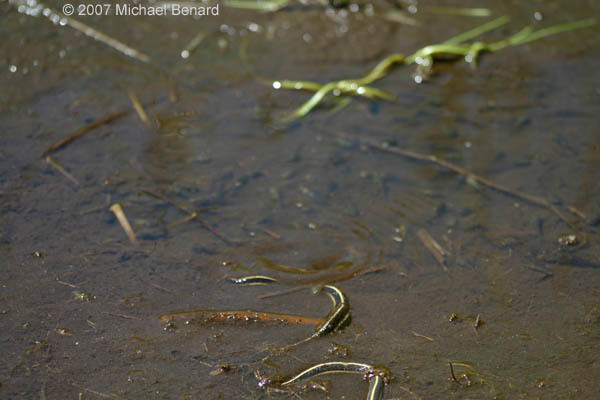 From our vantage point in the grass, we could see a mountain garter snake on the edge of the pool, eyeing the tadpoles. We slowly sat down to watch what would happen. 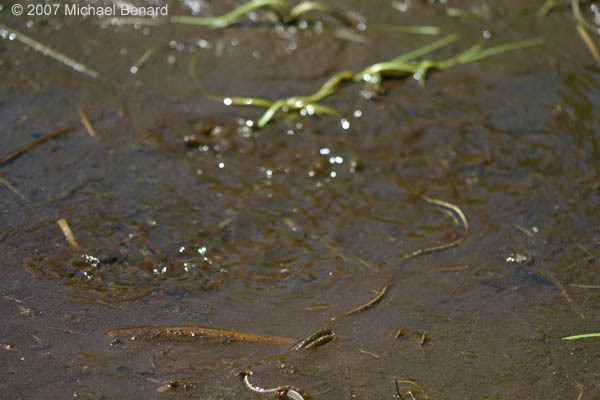 The snake made a few flicks of its tongue, and then slipped through the water into the middle of the tadpoles, its head disappearing into the mud beneath the tadpoles. 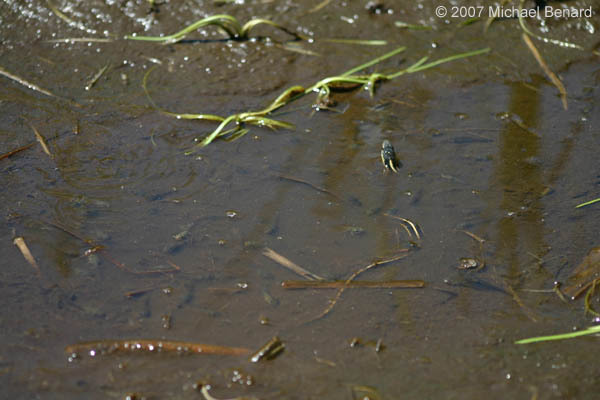 Perhaps oblivious to the coming threat, the tadpoles barely moved. The calm was broken as the snake struck, and the pool turned into a boiling mass of twisting coils and thrashing tadpoles. The storm lasted only a few seconds. The tadpoles were again sitting still. 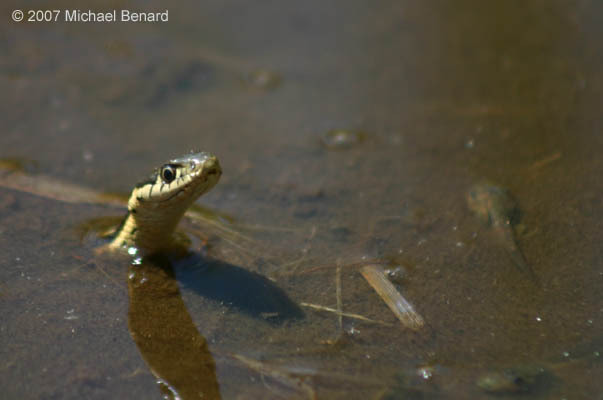 Once again the snake’s head was back above water, but this time it swayed back and forth slightly as it swallowed an unlucky tadpole. We watched, fascinated, as this process repeated every couple minutes. In its struggles, the snake would thrash and twist itself into knots. 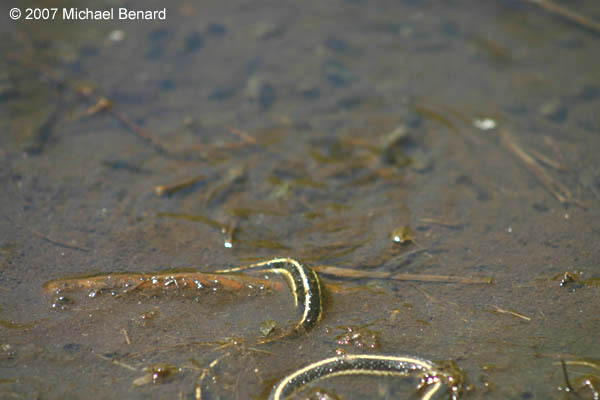 The bursts of activity were punctuated by rests, in which the snake would sit among the tadpoles, its head above the water, tadpoles only a few centimeters away. Eventually, the snake seemed to slow down. The wait between strikes increased. 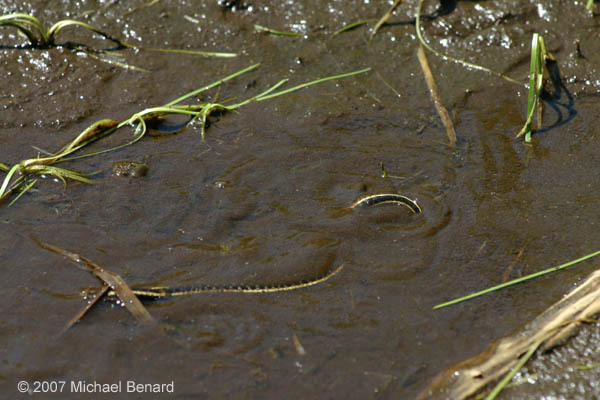 No longer slender, the snake’s body was bulging, the skin of its body stretching to accommodate a large meal of tadpoles. The skin between the scales added gray-blue blotches to the dorsal color of the animal. Satiated after 20 minutes of feeding, the snake left the pool to find a safe spot to digest its meal. Who knows when it will get a buffet like this again! 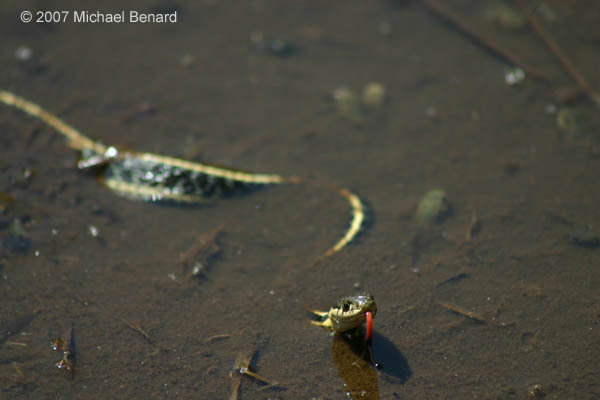 This entry was posted in Natural History and tagged Frog, garter snake, pacific chorus frog, Predation, Snake. Bookmark the permalink.